Beautiful views, especially over water, can do wonders for our sense of well being. 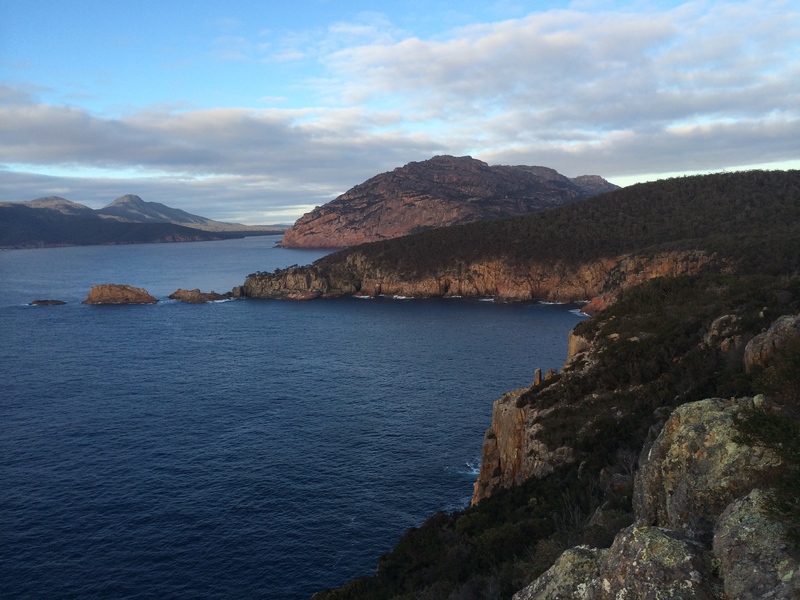 This image is from the East Coast of Tasmania, Australia in an area called ‘the land of the sleeping gods’ by local Aborigines. This post is designed as an introduction to the wealth of ways the elements are, and can be, an integral part of our wellbeing. It shares a selection of my growing collection of resources on the subject, listed at the end of the post. Over the coming months the aim is to explore the resources and the themes arising from them in greater detail. Given the diversity and scope of the resources, it took a while to decide how to present them. One option was to compile a list under headings such as yoga, meditation, exercise, the immediate environment, Martial Arts, medicine/healing and healthy eating. That approach would mean jumping between different elemental ‘systems’ and different parts of the world. 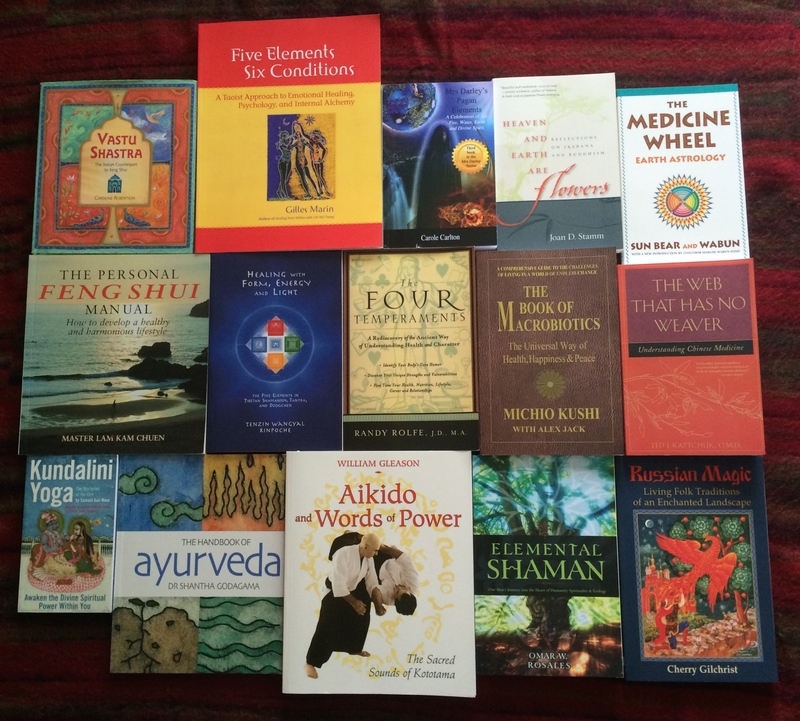 A selection of the impressive books on wellbeing and the elements covered in this post. Realising that no classification would be perfect, I opted to share the resources by broadly grouping them in geographical/cultural regions, apart from the section on Shamanism, which spans many parts of the world. This enabled me to list references that drew on the same set of elements. There are gaps of course, particularly Africa. It’s also been challenging to find accessible resources on Australian Aboriginal views on the elements and wellbeing. I’ll continue with my explorations. There are also unavoidable overlaps in the list, such as the book on Russian magic referring to shamanism. One has to start somewhere! One day I will draw a mind-map of the resources and see how that goes. My explorations continue to discover more about Australian Aboriginal perspectives on the elements, including how they relate to wellbeing. 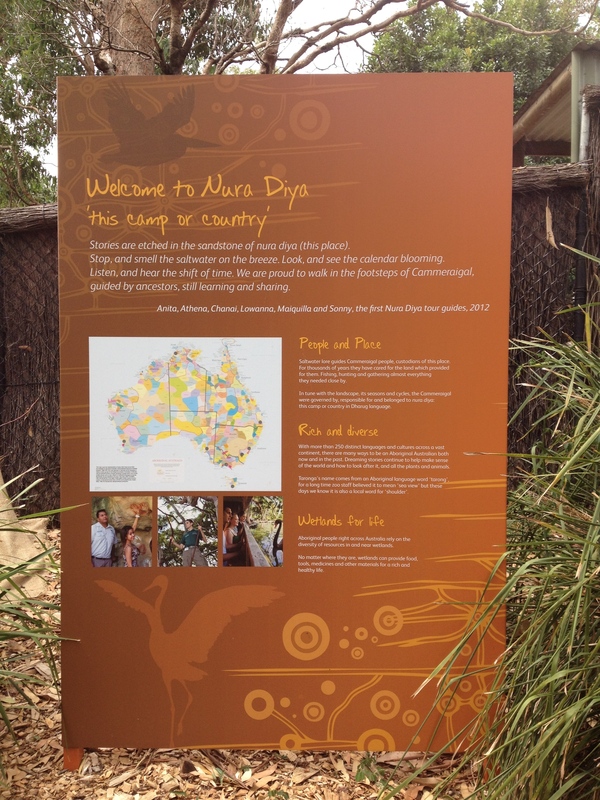 This image, inviting visitors to stop, smell and look at the place around them, is from Taronga Zoo, Sydney. The resources are all in English, as that’s my sole language. Many of them will be influenced by a Western worldview. No doubt there is a wealth of material available in other languages. To explore those would mean forming collaborations with people conversant in both English and another language. Anyone interested should let me know. Also get in touch if you would like full reference details for items in the list. Caveats aside, I’ve found these resources informative, thought-provoking and at times inspiring. They range from populist to works aimed at academics. Their geographic and cultural spread is evident and indicative. The resources demonstrate that most, if not all, of the major healing/medical sciences across human history, including in the west until ‘modern’ times, have been based on the elements. Techniques such as acupuncture, meditation, qigong, yoga, chakra balancing/cleansing and certain forms of massage come to mind. The resources emphasise the importance of the elements to both our internal bodies and externally. That they are fundamentally expressions and flows of energy. That we are part of nature, not separate from it. In sharing these resources my hope is that you too can find something of interest. Here’s a brief guide first to take you through the resources: the word ‘influences’ is used to cover the situation where a system from one region/culture has been adopted and/or adapted by another; the list of elements directly under each heading describes which ones are included; where ‘plus one’ is referred to, it means that another element may sometimes be added; next the title of the resource is given in italics; the underlined words aim to give a quick view of the topic at hand; the author and the year of publication are included in brackets; finally, there are some notes where I felt some more explanation could be helpful. The Web that Has No Weaver – Understanding Chinese Medicine (Kaptchuk 2000). Note: I love the title of this book. The contents are excellent as well. The Personal Feng Shui Manual – How to Develop a Healthy and Harmonious Lifestyle (Lam Kam Chuen 1998). Note: One of MANY books written about Feng Shui. Kundalini Yoga – the Mysteries of the Fire (Aun Weor 2012). Also note the healing power of Kundalini dance. The Book of Macrobiotics – The Universal Way of Health, Happiness & Peace (Kushi and Jack 2013). Note: Michio Kushi, the senior author of this book, died at the age of 88 on December 28th, 2014. He was instrumental in bringing Macrobiotics to the west. Macrobiotics is based on the yin-yang and the Chinese ‘elements’. Kushi does not use that term in the book, calling them the five transformations instead – a more accurate description. Note: The Chinese ‘elements’ form the foundation of the tea ceremony in Japan, which is designed to calm the mind, body and spirit. So far I’ve been unable to find a useful book in English that describes this. Mrs Darley’s Pagan Elements – A Celebration of Air, Fire, Water, Earth and Divine Spirit (Carlton 2010). Note: This book includes the healing properties of the elements. The Divine Spirit is referred to as ‘ether’ in the text. I’m pleased that Mrs Darley recognises the fifth element. The Four Temperaments – A Rediscovery of the Ancient Way of Understanding Health and Character (Rolfe 2002). Note: The four temperaments and corresponding humors were the basis of western medicine for over two thousand years. They were linked to the primary elements of earth, fire, air and water by Aristotle, whose philosophy dominated western thought until the ‘modern’ era we are currently in. Russian Magic – Living Folk Traditions of an Enchanted Landscape (Gilchrist 2009). Note: This book refers to the fundamental importance of the Tree of Life and the elements earth, fire, water and air to Russian beliefs – one imagines they would underpin healing and health creation (so far I haven’t been able to find an explicit link in this book). The Medicine Wheel – Earth Astrology (Sun Bear and Wabun 1992; earth, fire, water and air). Based on the wisdom of Native Americans. Note: The next resource is not focused on wellbeing, it does however touch on the importance of the elements to shamans/traditional healers and broadens the geographic/cultural coverage. Elemental Shaman – One Man’s Journey into the Heart of Humanity, Spirituality & Ecology (Rosales 2009). Contains four chapters based on Fire (Toltec, MesoAmerica), Earth (Cherokee, North America), Water (Maya, Central America) and Air (Bhutan). Bellyfit – a holistic exercise system for women based around the elements of earth, fire, water, air and spirit (www.bellyfit.com). Note: Developed in the USA, the system includes yoga, meditation, exercise and dancing inspired by music from the Middle East, Africa and India! Most likely a hybrid of Indian and European influences. Definitely American! This entry was posted in Aboriginal Australians, Aether/Space, Air, Alchemy, Books & reviews, Central and South America, China, Earth, Europe, Fire, India, Japan, Magic, Martial Arts, Popular culture, Spirit, The five elements, USA, Water, Wellbeing, Wood and tagged Air, Alchemy, Australian Aboriginal, Ayurveda, Buddhism, China, earth, Fire, India, Japan, Kundalini, Magic, Steiner, the elements, Water, Wu Xing. Bookmark the permalink. ← Happy New (elemental) Year! I really appreciate all of the time and effort you have put into creating this list of resources for delving deeper into the elements as they relate to our well being. There are so many interesting areas to explore and some great titles!